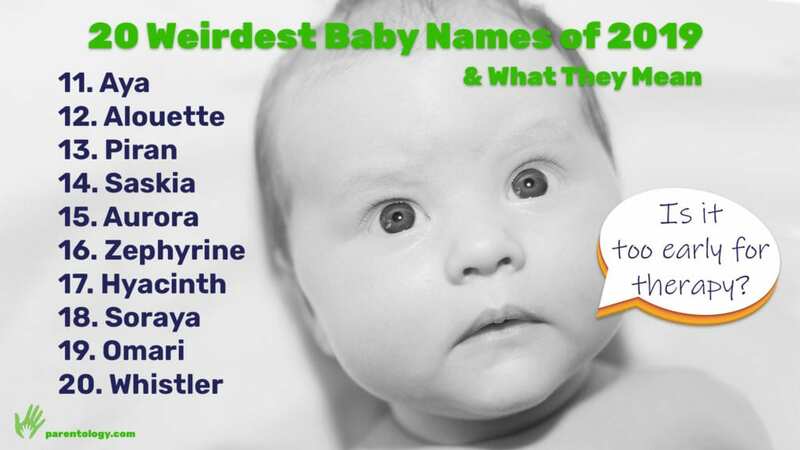 Weird baby names are in the eye (or ear) of the beholder, and they’re not just a recent celebrity invention. In the 1600s, nearly half the baby girls in the Massachusetts Bay Colony were given one of three traditional names: Elizabeth, Mary, or Sarah. The Puritans gave their children biblical names, but as many as 4 percent enjoyed much more creative options. Some opted for grandiose Bible names like Zerubbabel (meaning “from Babylon”), while others picked random baby names, such as Notwithstanding Griswold. The “weirdness” of baby names is subject to changing fashions and fluid trends — such as when Madison became popular for girls after Daryl Hannah appeared as a mermaid named Madison in the hit 1984 movie Splash. Indeed, in this time of gender-fluidity, having a more neutral baby name is more popular than ever. 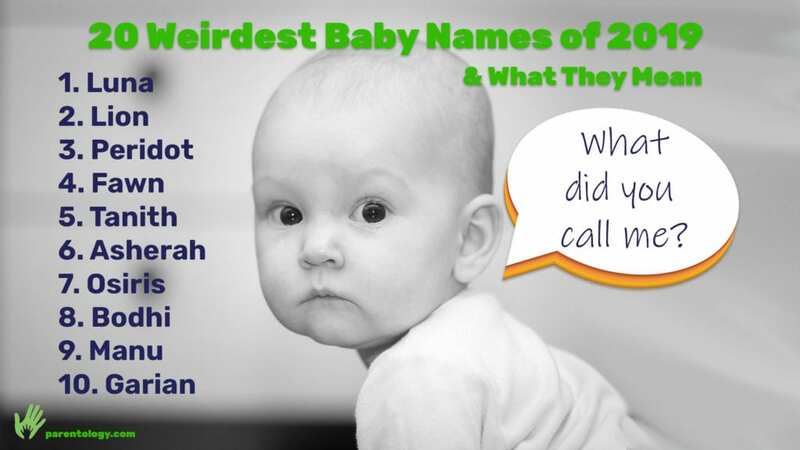 So, with that in mind, here are the 20 weirdest baby names of 2019. For now. Because the truth is that it’s only a matter of time before these so-called “strange” monikers become some of the most popular. Luna means “moon” in Latin. It has a pleasing “oo” sound that is currently fashionable. Names of gemstones are always popular for girls and increasingly so for boys. Peridot is an unusual gender-neutral name derived from a green mineral that forms from lava. Pronouncing the “T” at the end is optional. Either a baby deer or a yellowish tan color. In Egyptian mythology, Osiris was the god of the underworld. Bodhi is a Buddhist term meaning “enlightenment,” gaining in popularity thanks to its use by celebrity moms. Sometimes spelled Gharyan or Garyan, is the name of a city south of Tripoli in the northern African nation of Libya. Although, it certainly wouldn’t sound out of place among the Knights of the Round Table. Alouette is typically used for girls. It means “skylark” in French. Piran means “prayer.” It’s a unique option for those wishing to honor Gaelic heritage. Many European names have fallen out of favor with modern parents. But Saskia, a Dutch name derived from a Germanic term for knife, is an exception. Aurora has several meanings. It means the Roman goddess of the dawn, the scientific term for northern lights, and the name of a Disney princess. Choose the meaning you prefer. “Zephyr” is the ancient Greek term for the west wind. Zephyrine is a feminized version. Hyacinth is an unusual name rooted in ancient Greek tradition. It’s also the name of an exotic flower. Soraya is a girl’s name meaning “jewel.” It was born by several members of Persian royalty. Omari means “God the Highest” in Swahili and can mean “red” in Arabic. It is a gender-neutral name. Whistler gives the effect of a happy-go-lucky person. And a ski resort in Canada (which can make you happy.) It’s also the surname of a popular American painter. 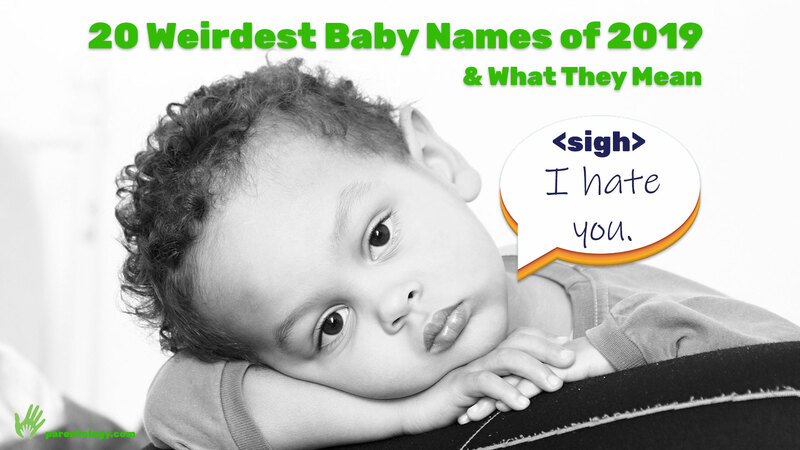 Do you think these baby names are weird or wonderful, strange or super? Let us know in the comments below. What If Your Child’s Bully Is Their Sibling? What If Your Spouse Is Your Child’s Bully? What If Your Kid Is the Bully? 5 Steps to Take ASAP!